Dock Box is Versadock’s secure, spacious, versatile and waterproof storage box. 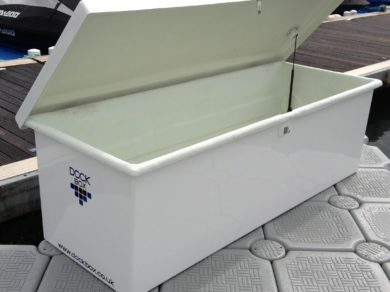 It’s the perfect accessory to put next to your boat for storing all types of gear. Available in three sizes, the standard Dock Box is made of strong GRP construction with a gloss finish. It is supplied in white but can be coloured and personalised as required. We can secure your Dock Box to the dock at the time of installation or you can install the box at any time in your chosen location. The Dock Box locks securely using a padlock and is a great solution for marina owners to rent to their berth holders too. Please contact us for assistance with your Dock Box order.